[I wrote this yesterday on the plane] I'm on my way back from participating at the DiamondCluster consulting firm's Exchange event. This one had the topic of "Reinvigorating Innovation". Speakers included Arizona State University president Michael Crow sharing his bold changes for the school, Dupont's Bob Cooper talking about their leadership development program, Campbell Soup Chief Strategy Officer Carl Johnson talking about how they revitalized the company, and even real estate consulting company head and famous football player Roger Staubach talking about management. Attendees included senior executives from Motorola, Hallmark, insurance companies, financial service companies, and even Craig Mundie of Microsoft. I'm a DiamondCluster Fellow, along with John Perry Barlow of EFF and Grateful Dead fame, Gordon Bell of DEC and now Microsoft, Vince Barabba the recent General Manager of Corporate Strategy and Knowledge Development at General Motors and twice director of the U.S. Bureau of the Census, and several others. At the two and a half-day Exchange meeting I listen to the other speakers, sometimes am asked to comment on stage about what they said, often comment from the floor like other attendees, sometimes give a presentation, and always spend lots of time with everybody there. An important part of each Exchange are the recreational activities where the attendees spend time together and interact in a more social environment. Golf is always a major activity for those that want. (One of the sessions each year has been held at the "revered" golf course at Pebble Beach.) For those of us who don't play golf, they provide other group activities. I've watched a polo match at one event, driven a Land Rover off-road in the mud at another, and paddled a kayak in Monterey Bay at yet another. 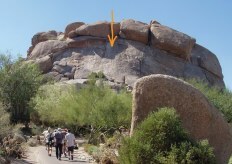 This time we were at the Boulders resort north of Phoenix, Arizona, and the alternative activities were going on a tour of some Frank Lloyd Wright buildings nearby or rock climbing. 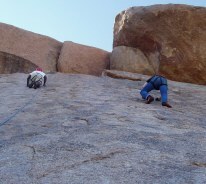 I chose the rock climbing. 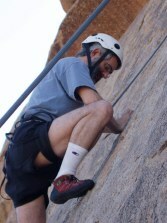 I've never done "real" rock climbing before (with ropes and other equipment). I've only climbed on rocks in my hiking boots and maybe "all fours". Like all of these recreational opportunities, this was "suitable for total beginners", so it was a chance to try something new in a safe, short-term oriented environment (they tell us...). All of this buildup is just an excuse to post these pictures so my family and friends can see them. To those of you who don't care, or really know how to climb and see all my bad technique: Sorry. 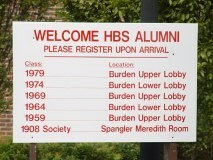 This weekend is the 25th reunion of for my class at Harvard Business School. (For some reason they make some of the reunions in the fall and some in the late spring.) I attended the Friday events and lunch today (Saturday), but tonight I'm on a plane on the way to attend DiamondCluster's Exchange event in Arizona. I'm speaking in the morning. I like attending reunions. It's interesting and often emotional to catch up with people. We get to laugh about old times, mourn our lost classmates (three of the original 90-some in my section are no longer with us), hear the problems some of us have had to deal with (at work and home), and get a new checkpoint as we watch each other "mature". Some have already become financially independent. Some are giving back to the community in various laudable ways with their time. Some are serial entrepreneurs. Some head very well known organizations. Many talk of raising their kids. 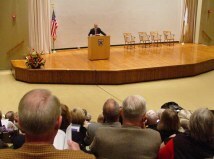 There are classes to attend to hear from professors on interesting topics. There were professors who were there when we attended, there are new ones, and even some who were our classmates. In the evenings (last night and tonight) there are special parties. Last night were the Section parties. During the first year of HBS, the class is split into sections of about 90 people and you meet in one classroom with just those students all year and again for a few classes the second year. Close bonds are formed. 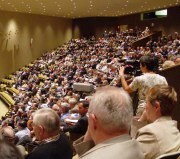 Many people attend the reunion just to go to their section party. Tonight is the other party which is for everybody in our year together. Some of the HBS'79 alumni donated "give aways" that we got in a goodie bag. Actually, the goodie bag was a nice leather briefcase/laptop case. We got a hat, mugs, dollars and cents off coupons (we have senior people at eBay, Staples, Pepsi, and much more in the class), and lots of other stuff. Unfortunately, some of the giveaways (including SuperBowl tickets and a trip to Hawaii) could only go to one person. That's where I came in. I got a call from classmate Eddie Samp that he wanted me to help give away the big "door prizes". He wanted something that reflected me and the class, that was "real fair", and fun. What I ended up doing was writing a "simple" application that chooses random numbers. I based it generally on the UI code I used for ListGarden. It has a setup tab where you can enter the number of prizes and people as well as numbers used to initialize the random number generator (e.g., number of shares last traded on the NYSE, the price of a "shire" -- the name of the fictitious product sort of like a shirt and sort of like a tire used in a simulation at school -- on eBay [searching on eBay does find things with "shire" in the name], etc. ), a tab for running tests to show the fairness of the numbers generated, a tab for entering the description of the prizes, and finally one to do the drawings and display each result in turn (complete with a "surprise" mystery prize that goes to the main organizer that Eddie requested). I sent the program to Eddie and he's probably running it now as I write this at 40,000 feet, projecting the results each time he presses a "Draw" button while the attendees watch to see if the numbers drawn match their number on an alphabetical list. Before he runs it, Eddie is reading a short letter from me. In it I thank my sectionmate John Reese who helped test early versions of this app and gave me valuable feedback which I listened to just as I did when he commented on my early VisiCalc designs back in 1978 and 1979. I tried real hard to make the program foolproof and fair, but having a non-computer person run an alpha test in front of hundreds of CEOs, consultants, business people, and their spouses without me there to deal with slight mixups is scary. Also, I hope I won something good... I'll find out when I land and check voicemail. To add to making the program "fair", I had him announce that I am releasing it as Open Source under the GPL. If anybody wants to try it, or check it to tell me how I messed up the randomness or whatever, you can find it listed on the Products page of the Software Garden website. I've posted both Perl source and a Windows .exe version. My essay "Software That Lasts 200 Years" has proven very popular. It discusses software industry structure that could be helpful for a particular type of software. It also suggests learning from other areas of engineering to find principles to follow when creating long-term software. I've just finished another essay that is a step towards coming up with some of those principles. I look at the study of major accidents in societal infrastructure such as nuclear power and process plants. I also look at the 9/11 Commission Report to examine the handling of the immediate results of the hijackings and crashes. These are examples of systems being stressed in foreseen and unforeseen situations. Terrorism is relevant because it can result in forced changes to the configuration of a system that were unanticipated by the original designers and brings in a wide range of participants. From all this I glean some principles that can be applied to design in general. As part of examining the 9/11 Commission Report, I list a series of excerpts that relate to communications, unplanned activities, and the role of regular people caught up in the situation. These are areas that relate to things that interest me and that I've been covering for a long time. Whether or not you are interested in "200 Year Software", I think the information there can be very important to many designers. Read "Learning From Accidents and a Terrorist Attack". This morning the Massachusetts Software Council had its Fall Membership Meeting. 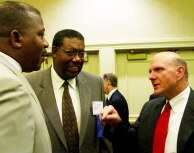 The two speakers were Dr. Jack Wilson, President of the University of Massachusetts, and Steve Ballmer, CEO of Microsoft. 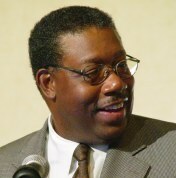 Dr. Wilson was most recently the CEO of UMassOnline, the University of Massachusetts' online university that currently has 14,700 enrollments in the workplace in 40 degree programs (this is separate from the 58,000 undergraduate, graduate, and continuing education students at physical UMass), and was a professor at Rensselaer Polytechnic Institute, and held lots of other interesting posts. He told us a lot about the UMass system (5 campuses and 80 off-campus sites) and lots about their research (over $320M in sponsored research, 90% outside of Route 128, ranking #3 in Massachusetts). Interesting slide: "Maintenance contract on every degree: No longer good enough to give a student a four year degree and send him or her out into the world with a quick goodbye and an occasional request for a donation. Need to be there for every student throughout his or her career: updating a degree, career direction changes, and lifestyle education requirements." He talked about the change from the old "transmission model" of education, with the face to face lecture where technology (TV) "pushes the back wall out a few thousand miles" to the "Distributed Collaborative Model" of many to many that has Moore's Law, etc. 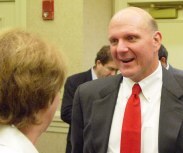 First Microsoft board member and Massachusetts Software Council Trustee Emeritus Jim Cash introduced Ballmer, telling a lot about his personal side (devotion to family) and how he sees him through Jim's role as a director. He was especially impressed by how hard and well Steve worked with Scott McNealy to get the Sun deal done. He ended with: "I am very pleased to introduce you to the man that expects more than others think is possible, dreams more than others think is practical, is willing to risk more than others think is safe, and he cares more than others think is wise." His talk had two parts. First he talked about opportunities in the industry in general, then why is Microsoft a good company to partner with to get that opportunity. Microsoft's current mission is to "Enable people & businesses throughout the world to realize their full potential." (It used to be putting a computer on every desk and in every home.) He said that there are only two industries in the world that have that mission: Ours and Jack's (the other speaker, meaning education). The computer industry provides people with tools to allow them to create, explore, learn, express themselves, communicate, collaborate, analyze, operate, etc. We're all enablers. Microsoft is very tool oriented. Microsoft makes very horizontal tools. Others in the audience make perhaps more vertical. The number of unmet needs that people express they still need is huge. Opportunity. Then he said nice things about Massachusetts and the companies started here and their innovation and the many great schools, etc. He talked of the envy of some of what we have: The University of Washington where he lives is a great school, but it is just one great school. You have to go many miles to find another. The core of moving the industry forward is being committed to innovation, trying new things but integrated with or building upon what we have already, and being responsive to customers. A little thing that they did that was probably the biggest innovation in their software engineering process was adding to Windows the automatic error reporting that can happen after a program crashes (which he knew we were unfortunately familiar with). They now have real data to help them. They've instrumented other things (like for their Japanese version) and made major improvements in their products. He talked about capturing data. He noted that he saw only Bob Frankston in the audience was using a laptop (actually a Toshiba Tablet PC) instead of paper to take notes -- we have far to go. He talked about how Microsoft's stuff needs to work with other people's stuff, that there is much opportunity in utilities (big and small). He related how I talked to him about spending so much time supporting the PCs of my extended family and how that needs to change -- there is an opportunity. He talked of several other opportunities if we are innovative. Advertising and information will be revolutionized. He didn't appreciate that 6 or 7 years ago. Seeing George Bell (who was head of Excite@Home) in the audience, he said that George had started teaching about just in time ads to all of us years back, and Google is now continuing the teaching. The right info at the right time is important. Time to talk about the partners. They know that they need others to make all the products to take advantage of the opportunities, and to help them sell their products. He said just a bit about Longhorn which will help with rich client applications (they've announced a date and modified the specs). He said much more about .Net. He showed a slide showing how much better it is than Win32. He mentioned how Deb Besemer's company BrassRing had committed to .Net early. He had another slide on interoperability. He sees Web Services and integrated applications using them as being very important. Not just interop with Windows, but also to Unix, etc. Another slide was about their decision to make security "job one", changing Windows development plans and R&D allocations to that end. He pushed SP2. It doesn't do everything, you still should get an anti-virus, but it does an awful lot. The next section started with a slide titled "Windows or Linux?" He talked about developer productivity, total cost of ownership, security, interoperability, and intellectual property risk. He gave numbers about security from Internet Security Systems and Forrester comparing Windows to RedHat, Debian, etc. For IP risk, he talked a lot about customer indemnification, for patent claims and copyright claims. They will pay the legal fees and damages. Eolas could be $550 million if they lose, but they'll pay (not that they plan to lose). He compared to Novell, HP, RedHat, and IBM. He appealed to us as developers to see what is best for us. Finally he asked for feedback and input now or later. With that he started Q&A. Bob Frankston asked about tools for end users to create their own apps, not just professional developers (like with .Net). Yes, it is needed, and not enough is being done. He was asked about what issue they would bring up with the Presidential candidates. As the CEO of Microsoft he has no such list. Big issues for society are the big issues for society and are being addressed. Broadband is being addressed, it may happen faster or slower but it will happen. There is no big industry specific issue. Having an educated workforce is very important. He hires more people from India who come over here than he does that stay over there. He doesn't want us scaring off people who would move here for education. Graduate programs are down due to visa problems. A question about what is being taught at the colleges. He discussed theoretical vs. real engineering. He sees it often takes a few months to train people even from the "best" schools about engineering. There's not enough teaching about real-world software engineering, with large long-term projects. Finally, trustee Mary Makela asked about what type of ISVs do they like to partner with, and what type of companies do they like to acquire. They like ISVs that embrace and add unique value around their platform. They are working on improving working with ISVs, especially with helping ISVs and customers find each other. With respect to acquisition, they don't have an "acquisition strategy", they have a "strategy" and then it's make or buy. Occasionally, though, they will consider an acquisition outside of their stated strategy, such as with the SAP discussions they've disclosed. It wasn't in their strategy before or after, but would have been if a merger had happened. So, sometimes they'll do something that can only happen with acquisition, but we shouldn't expect him to talk about any possibilities there, of course. Last week I was interviewed by Halley Suitt for her "Memory Lane" series on ITConversations. ITConversations hosts a wide variety of series, including "The Gillmor Gang" with Steve Gillmor, Doc Searls, Jon Udell, and Dana Gardner, and "Intelligent Defense" with John Robb. Each is a series of recorded interviews and/or speeches. The one with me was just posted online today and you can listen to it either streaming or as a download (it's a little over an hour long -- a 22MB MP3 file). 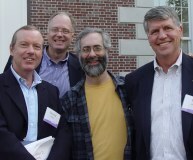 You'll find all the links on the "Dan Bricklin: Memory Lane" page. I hope you like it. These audio series are an interesting communications format that is part of a new form (sort of) of small-time publishing. The format is a long interview or speech (long by broadcast standards except CSPAN and some NPR) that is then made available online in a variety of digital formats, including MP3. The only "radio" involved is possibly Wifi in an Internet connection. Today, many people have high speed Internet connections, so downloading a 20MB file takes only a couple of minutes (and RSS with enclosures makes for easy background downloading). Many people also have portable MP3 players or good sound systems on their desktops and they are accustomed to listening to stored digital sound. With this form of content there is no time slot to fill or miss as there is with traditional radio/TV broadcast. Word of mouth, blogs, and search engines can help build up an "audience" for a particular "episode" after the fact without needing to worry about how many people are tuned in at a particular time. A narrow-interest piece (in hindsight) only costs the production expenses and not wasted distribution since storage is cheap and bandwidth is mainly spent on popular pieces. Something less popular doesn't preclude something else that may be more popular in the same "time slot". A "hit" can last a long time. Digital music players (especially those with large storage capacities) make it easy to carry and save content for whenever you have time to listen, even days or weeks later. Being stored, you can pause the playback, repeat, listen in small chunks of time, etc. Because it can be done when mobile, listening to content that isn't really worth devoting scarce, sit-down, quality time (such as my interview) can be mixed with other activities compatible with listening, such as traveling, exercising, or doing household chores. Being available online, you can recommend a particular piece to others after listening. There are differences from normal blogs and websites. HTML text and static image content is more of a sit-down affair. You can skim web pages, follow links, and quickly jump into the middle of something. (You don't need to read a blog from day one or all of each post on a given day.) Audio and movie-like video requires at least somewhat sequential listening. On the flip side, you can listen to audio while moving and using your eyes to do other tasks. We will be fine-tuning this format. How long should something be? Should there be breaks for pausing and bookmarks of some sort to get back later? (I like to jog for 20-30 minutes -- a good time to listen -- so a one hour interview runs into shower time and my MP3 player isn't waterproof.) Should there be companion transcripts with frequent time markers (with permalinks) to let you recommend snippets to friends or refresh your memory later? (ITConversations has some transcripts, but there are no time codes before each paragraph.) I may be willing to spend an hour listening to someone talk but you may only be interested in the 3 minutes I found that I think is relevant to your situation. All this has been possible for a long time, but the confluence of widespread high speed Internet connections, large-capacity portable music players, good search, blogs, and RSS is making this more mainstream. It is also part of a trend for non-mega corporation, non-timeslot publishing of audio/video media with Internet and word-of-mouth publicity. A great example is Jibjab's "This Land" Flash movie (one of many they've done). An older one is "405 The Movie" (make sure you read "The Making of 405" after you've seen it to understand what's so special besides the fact that it's funny).